We are so thankful for the way that God used HOPE Coffee in 2017! Over these past several years, your choice to drink HOPE Coffee has resulted in new homes, fresh starts, income opportunities, access to clean water and most importantly, LIVES CHANGED FOREVER FOR JESUS! 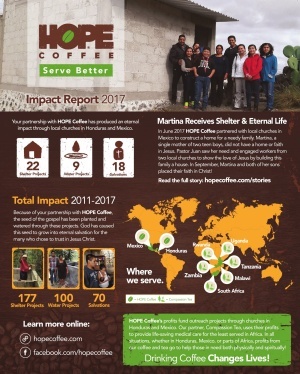 See how God used your cup of HOPE Coffee last year by downloading our 2017 Impact Report. Thank you for Serving Better!